After seven straight games with double-digit targets, Beckham only saw four last week. Still, that was good enough for 74 yards and a score. I’m expected double-digit targets and even better production this week against an Eagles defense that will be starting second- and third-string cornerbacks this week. Even before the injuries started piling up, they already ranked as a top secondary to exploit. Coming into this week, they’re giving up the most fantasy points per game to outside wide receivers and the third-most schedule-adjusted fantasy points per game to WR1s. You didn’t need me to tell you to start him, but I think it’s safe to say you can also expect a monster game. Since returning from suspension, Edelman ranks ninth in targets (9.2) and 13th in fantasy points per game (16.6). In each of these six games he’s also led New England’s receivers in expected fantasy points. That should be the case again this week, against a New York Jets defense that funnels action toward the slot (where Edelman runs 70% of his routes). New York ranks second-worst in fantasy points per game to slot wide receivers (21.4) but ninth-best to wide receivers running routes on the outside (18.3). Golladay set a career-high in targets in Week 10 with 13 (good for 78 yards and a score), and then surpassed that mark in Week 11, totaling 14 targets, 113 yards, and a touchdown. With Marvin Jones out for the second straight week, Golladay is again a must-start. To sweeten the deal, Golladay runs 70% of his routes from the outside, and the Bears are giving up the fourth-most fantasy points per game to outside wide receivers (27.9). As outlined here, Chubb has everything working in his favor this week – improved volume, great efficiency (he’s our highest-graded running back), and an ideal matchup. The Bengals rank third-worst in both yards allowed per carry (5.11) and rushing fantasy points per game allowed to opposing running backs (18.0). He should be started as a low-end RB1 this week. After a slow start to the season, Fitzgerald now ranks top-20 in targets per game (7.8) and fantasy points per game (16.4) over the last five weeks of the season. He’s an easy start this week up against a Chargers defense that is giving up the third-most fantasy points per game (18.6) to opposing slot wide receivers (where Fitzgerald runs 77% of his routes). On Tuesday, Eagles OC Mike Groh said it’s been challenging to find ways to fit new Tate into the offense. Clearly that’s been true, with Tate totaling just seven receptions and 67 yards across two games. After a much softer matchup against the Saints, Tate now gets a Giants defense that is allowing the fewest fantasy points per game to opposing slot wide receivers (where Tate has run 71% of his routes since joining the Eagles). You might still be starting Tate in most leagues, but he’s just a fringe-WR3 this week. The Chargers have been taking more of a run-heavy approach in recent weeks, ranking just 30th in passing plays per game (29.8) since Week 5. It’s unlikely they’ll need to go pass-heavy this week as 12.0-point favorites against the Cardinals. All season, quarterbacks have struggled to put up points against Arizona; they rank fourth-best in schedule-adjusted fantasy points per game to opposing quarterbacks. In 40 career games, Hooper has seen more than eight or more targets just five times, but four of those games have come over his last six. Over this span, he ranks third among tight ends targets per game (7.7). Still, he has the worst possible matchup this week, up against a New Orleans defense that has allowed the fewest (schedule-adjusted) fantasy points per game to opposing tight ends in each of the past two seasons. McCoy has seen great volume in each of his last five (healthy) games but is still only a fringe RB2 this week. Buffalo has an implied point total of only 17.0-points (fourth-fewest) and Jacksonville ranks second-best in schedule-adjusted fantasy points per game to opposing running backs. Tampa Bay totals 3,610 passing yards through 10 games this year, or the most by any team through their first 10 games all-time. If Winston and Ryan Fitzpatrick were one quarterback, they’d combine to rank second all-time in fantasy points per game (27.1), with only Patrick Mahomes (2018) ranking above them. There is the risk Winston might get benched at some point this week, though I think it’s low, and especially so given the matchup. 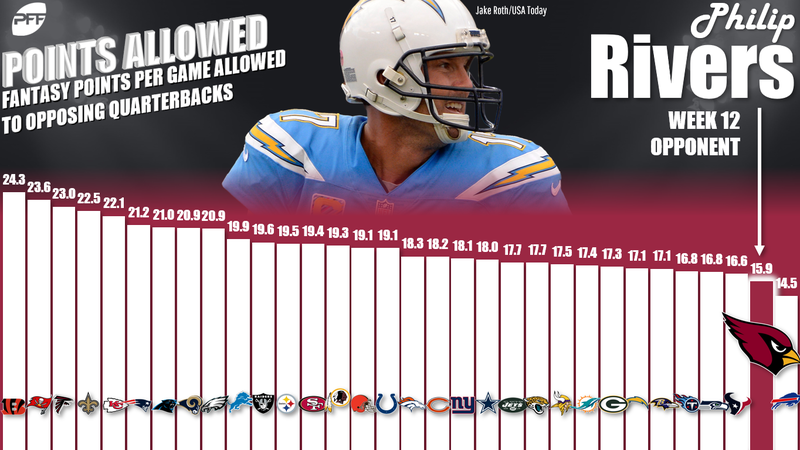 San Francisco ranks seventh-worst in schedule-adjusted fantasy points per game allowed to opposing quarterbacks. I’m expecting to see Edwards used as the team’s lead running back this Sunday. Last week, he out-snapped Alex Collins 49 to 17, out-touched him 17 to seven, and out-ran him by 97 yards (115 yards to 18). Not just that, but he was tremendous, ranking as our highest-graded running back of the week, forcing eight missed tackles on just 17 carries. He also has good gamescript and a soft matchup working in his advantage, favored by 10.5-points at home against the Raiders. Oakland is giving up the fourth-most rushing fantasy points per game to opposing running backs and rank second-worst in yards allowed per carry (5.12). In a 48-7 beatdown, Adams played on 55% of the team’s snaps, drawing 70% of the team’s carries (seven of 10) and 75% of the targets out of the backfield (six of eight). I like him quite a bit more this week, in a much better matchup, as 6.0-point favorites against a Giants defense that has struggled against the run since trading away Damon Harrison (the best run-stopper in the NFL). Before the trade, the Giants were giving up only 3.87 yards per carry. Since then, they’re allowing 5.27 yards per carry. With O.J. Howard out, Brate is an easy start this week as a high-end to mid-range TE1. In addition to better volume with less competition for snaps, routes, and targets, he also gets an efficiency boost with Jameis Winston back under center. Since entering the league, Winston leads the NFL in percentage of touchdowns thrown to tight ends (40.3%). With Kerryon Johnson (and Marvin Jones) out this week, Riddick is set up nicely for a big game. 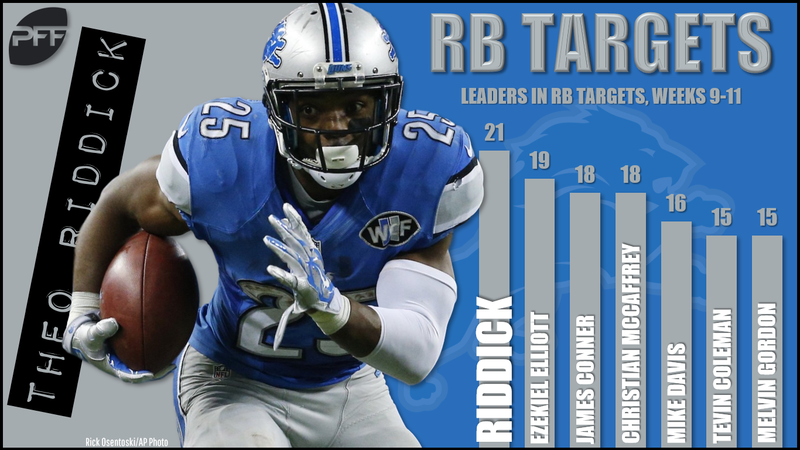 Riddick has seen at least six targets in each of his last three games, with only 45% of his routes over this span coming out of the backfield. He’s a borderline-RB2 this week. Enunwa averages just 3.7 fantasy points per game across his last four games. If that wasn’t enough to take him out of contention, he’ll draw Stephon Gilmore (our fourth-highest-graded cornerback) in shadow coverage this week. Blount should see better volume this week with Kerryon Johnson out, but his upside is still low given the matchup. Chicago is giving up the fewest rushing fantasy points per game to opposing running backs (6.9) and ranks best in yards allowed per carry (3.26). Martin is dealing with an ankle injury but is likely to play. On top of Martin historically never playing well when dealing with even a slight injury, he also has a brutal matchup this week. Gamescript won’t be good, as 10.5-point underdogs, and Baltimore is also giving up the fewest fantasy points per game to enemy running backs. Kirk posted a big game last week, recording a 3-77-1 line on four targets. He’s not in play this week, however, with Casey Hayward likely to shadow. In six shadow games thus far, Hayward has surrendered a combined six receptions, 79 yards, and zero touchdowns. Kirk is an easy fade this week. Rushing yards are worth 2.5 times as much as passing yards, and rushing touchdowns are worth 1.5 times as much as passing touchdowns. That gives Jackson big upside (as I tried to show here), after setting the Super Bowl-era record for rushing attempts by a quarterback last week. The matchup is advantageous as well, considering Oakland ranks worst in fantasy points allowed per dropback (0.76), worst in pressures generated per dropback (0.22), and third-worst in opposing passer rating (108.6). If Joe Flacco is still out, I’d be starting Jackson as a low-end QB1. Ridley and Sanu are both in play this week in deeper leagues. They’ve both seen between 18 and 19 targets over their past three games. Volume might be even better this week, with tough matchups for Julio Jones (in shadow coverage against Marshon Lattimore) and Austin Hooper (explained earlier). New Orleans is giving up the 10th-most fantasy points per game to slot wide receivers and the third-most fantasy points per game to WR2s. Ridley will run the majority of his routes against Eli Apple, while Sanu mostly gets P.J. Williams. Apple ranks 82nd and Williams ranks 108th of 111 qualifying cornerbacks in PFF grade. In a game with the highest over/under of the week (and by 5.5-points), Ridley is a high-end WR3 and Sanu is a high-end WR4. 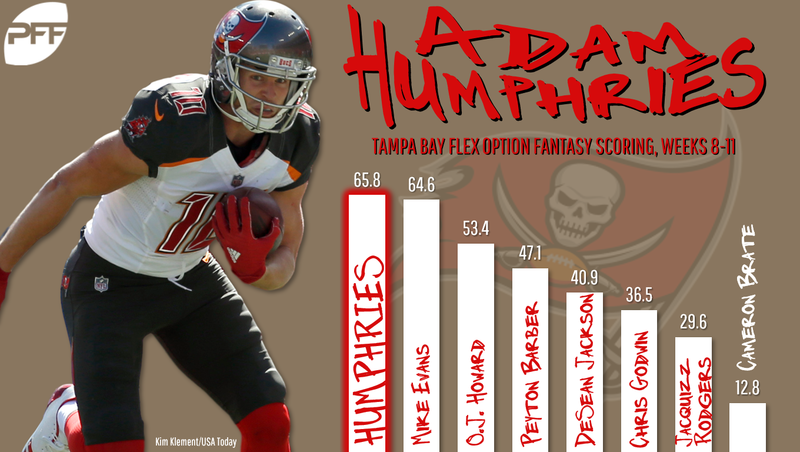 Humphries is averaging 16.2 fantasy points per game over his last four games and should now get a volume-boost with Jameis Winston back under center. This season Humphries has been targeted on 18.9% of Winston’s attempts but only 10.6% of Fitzpatrick’s throws. In a slightly above-average matchup this week, I’d start Humphries as a mid-range WR4. Cook was already Oakland’s top receiver in terms of both usage and production, averaging 2.1 targets per game more than Jordy Nelson (6.4 to 4.3). Now, with Brandon LaFell out and both Nelson and Martavis Bryant questionable, Cook should see heavy volume this week. The Ravens also have a tendency to funnel volume and production towards the tight end. 26% of Baltimore’s receiving fantasy points allowed has gone to tight ends, which ranks second-most among all defenses.